1. Preheat the oven to 180˚C, gas mark 4. Grease and line the base and sides of a 23cm springform cake tin with parchment and place on a baking sheet. In a large mixing bowl, use electric beaters to whisk the egg yolks with 110g caster sugar for 3-4 minutes, until thick and pale. Wash and dry the beaters thoroughly. 2. In a second, clean bowl, whisk the egg whites until soft peaks form. Gradually add the remaining 110g caster sugar and whisk until stiff and shiny. 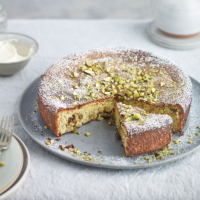 Using a large metal spoon, gently fold the yogurt and olive oil into the egg yolk mixture, followed by the ground almonds, baking powder, bicarbonate of soda, 75g of the chopped pistachios and the gooseberries.